Chemical/ Small Molecule conjugated to bovine serum albumin. Our Abpromise guarantee covers the use of ab6212 in the following tested applications. IHC-P 1/200 - 1/2000. Use in combination with tyramide signal amplification. IHC-Fr 1/200 - 1/2000. 1/200 - 1/2000. Use in combination with tyramide signal amplification. Digoxigenin (DIG) is a steroid found exclusively in the flowers and leaves of the plants Digitalis purpurea and Digitalis lanata. Digoxigenin is chemically closely related to Digoxin, the cardiac glycoside used for the treatment of various heart diseases. The term 'genin' at the end of Digoxigenin, refers to only the aglycone portion (without the sugar) part of the molecule,thus Digoxigenin is the steroid component of Digoxin, - minus the (digitose) sugar residues. DIG can be covalently added to proteins or nucleic acids which makes it very useful in diverse applications. 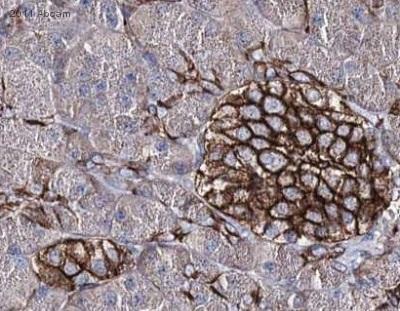 ab6212 at a dilution of 1/1000 staining Digoxigenin from human pancreatic tissue sections by immunohistochemistry (frozen). The antibody was incubated with the tissue for 2 hours. This image is courtesy of an Abreview submitted by an anonymous researcher on 9 December 2005. 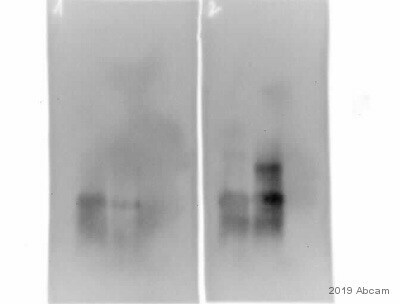 I would like a certificate of compliance for the following product: Catalog # ab6212 Anti-Digoxigenin antibody [HRP.21H8] (HRP) Lot # GR63837-5 Thank you! I have attached the CoC for ab6212 to this email. I have received the data from this customer. Attached please find the protocol (sheet1), results(sheet2) and modified ELISA schematic (tif)fromthis customer. Would you please help this customer check the results? Thanks so much for sending the protocol, data and schematic image. That is all very helpful to see. Our customer recently has ordered ab6212 with lot# GR62763-3 and GR62763-4 (requesting 2 different lot when putting the order). Shehad usedbothlot# gr40978-1 (two vials, good results) andlot#Gr44124-3 (two vial, unidealresults and data different from lot# gr40978-1) in ELISA application. In order to confirm her experimental data, she would like to obtain two different lot of ab612 to reconduct. Therefore, she would like to confirm thatwhether these two lotsare the same batch of manufacture (she wants 2 independent batch)? How many stock with lot# GR62763-3 and GR62763-4? If the experiment set up ready, she calims that 10 vials may be needed. Regarding lots GR62763-3 and GR62763-4 for ab6212: These are treated as 2 different lots in our stock system. However we receive this antibody from an outside lab and, from this lab, GR62763-3 and GR62763-4 are not produced in separate production runs. They are part of the same production run. I hope this helps. Please contact me again if you have any further questions. ab6212 (Mouse monoclonal [HRP.21H8] to Digoxigenin (HRP)) What is the concentration of this antibody? Thank you for your patience in this matter. I have received a reply from the originator of ab6212. The concentration of this product is lot dependent, usually between 0.2 - 0.5 mg/ml. The concentration of our present lot is ~0.4 mg/ml. Please don't hesitate to contact us again if you have further questions. 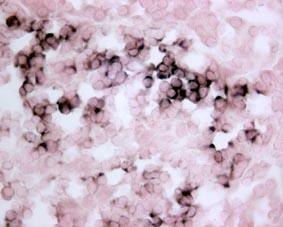 What concentration of antibody was used in In Situ Hybridization? Thank you for your enquiry. I have received word from the originator that they have not specifically tested this product in in situ hybridization. Please see their response below: This product was used successfully in IHC at the dilution of 1/1000. For in situ hybridization, we don't have any results, however we assume that many customers used it for this application. We recommend the dilution of 1/500 to 1/1000. I have removed ISH from the datasheet as a tested application; however, there doesn't seem to be any reason it won't work. Please let me know if you have any problems. ab6212 = Digoxigenin antibody [HRP.21H8] Ab concentration? Immunogen and specificity of Ab? Need to contact originator of ab6212. Thank you for your patience. Regarding ab6212 (Digoxigenin antibody [HRP.21H8]), here is the requested information: antibody concentration: 0.3 mg/ml immunogen: digoxigenin coupled to KLH (details unavailable) I hope this information helps. Please don't hesitate to contact me again if you have further questions.